Happy Year of the Ram! Our very own Travis Tanner rang in the New Year in Muscatine, Iowa, the US “home” of Chinese President Xi Jinping. 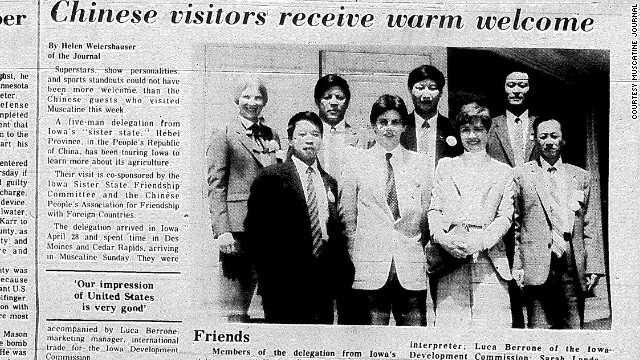 In April 1985, Xi —then a mid-level official— spent two weeks in Iowa as part of a Chinese delegation studying agricultural techniques. He stayed with a local family and befriended the local community. He returned to Muscatine in 2012 while on a visit to the US and reconnected with his hosts. Today, almost thirty years later, President Xi still recalls his time in the American heartland fondly, and counts Iowa Governor Terry Branstad, as well as many other Iowans, as his “lao pengyou”. We are excited to be working with states around the country to develop tailored strategies to increase Mandarin language learning and study abroad opportunities for local students. Special thanks to Wanxiang for supporting the 100K Strong mission, in particular for providing opportunities to Muscatine students to study abroad in China. In addition to Iowa, 100K Strong has various projects underway with California, Louisiana, Utah and Washington State. We are truly building a nationwide movement. Our next generation of leaders will hail from around the United States, and we must ensure that they have the China skills to compete, collaborate and succeed in a global economy led by our two great nations.